July 2016 - "Beatles, Stones, Pirates, Monkees, Marilyn, Cavern & Carlin"
(28) Central London / Leafy Berkshire – A double-bill of activities; a 1pm meet with director extraordinaire, Alan G. Parker and then, an almighty 8pm catch-up with two old, musical buddies, Dan and Mark (while A Hard Day’s Night, co-starring Keith’s mate, Lionel Blair, played in the background). (22-29) Leafy Berkshire – Even more fine-tuning of the Circus ‘68 and Cavern books. (22) Leafy Berkshire – The big day arrived. After 32-months of solid work, an early version (so-called galley) print of the new, supersized Hunter Davies Beatles Book landed on Keith’s door mat. “And it looks marvellous,” he beamed. (21) Leafy Berkshire – Work on the George Carlin also neared the end, with the ordering, from the States, of broadcast quality clips of his 2007 American Television Academy interview. - Work on the Circus ’68 project edged ever nearer to completion. With text (almost) in, it’s now time for Paul to work his design skills. (20) Leafy Berkshire – Another frantic day with notable discussions with (Carlin director) Alan G. Parker as well as Dave Cash and Bob Young respectively about the Cavern book and the impending Pirate Radio documentary. (14) Leafy Berkshire – Keith received a phone call from Bob (Status Quo) Young revealing some rather interesting Beatles-related news about the forthcoming Cavern book. (13) Leafy Berkshire – With work on the Pirate Radio DJs film also picking up speed, Keith held a long production meeting with (the famous, legendary) Dave Cash. (11 – 15) Leafy Berkshire – Book typing work shifted, and, from this point onwards, Keith’s time was pretty much was devoted to transcribing, typing and finishing work on the new, official Cavern club book. (6) Central London, The Spice (aka The Office) - With business still to work out on several of Mike Chapman’s projects, Keith travelled into the Capital again, this time to meet editor and cameraman, Dave Cook. (4 – 8) Leafy Berkshire – Work continued a’ pace on The Rolling Stones’ Circus ’68 book. May 2016 "Still cold... but it's hotting up outside"
(26) BAFTAs, London – Another trip to London, and another visit to that wold-famous, show-biz venue. Alongside top designer, Paul Skellart, amongst the luminaries Keith met that night; FA Chairman, Greg Dykes; DJ/ TV personality, “Diddy” David Hamilton and dancer, actor, film, TV personality, Lionel Blair (no less – see pic on photo page). Thanks to Chris Perry at Kaleidoscope for the invite and truly great night. (23) Leafy (Sunny) Berkshire – Another busy day with further, albeit brief, work on the new George Carlin movie. An email was also received containing some rather nice, most pleasant, highly interesting Lennon-related items. - With just 17 days to go, the Rock And Roll Circus / Pledge campaign stood at 87 per cent of its goal. “Almost there,” the team screamed. - Leafy (now overcast) Berkshire – Time also to update the blog on Keith’s website. -Meanwhile, over on Amazon.co.uk, a big thanks to “Angus/malcolmnews” for his 5 out of 5 stars review of Marilyn (paperback). His description of it, simply…”Excellent,” adding it was, “Quite a sad story,” which unfortunately it was. (16) Soho, Central London – A trip into the Capital to see director, Alan G. editor, Ian and see how work is progressing on the new George Carlin documentary… and it’s looking great!! (13) Leafy Berkshire – Pledge’s Rock And Roll Circus campaign stood at 82 per cent… “So near, yet so far away.” So, to help bolster sales, and reach the final goal, Keith recorded a special exclusive message for the campaign which was uploaded onto the Pledge site. (11) Leafy Berkshire – Archive work resumed on the new George Carlin movie. (5/6) Leafy Berkshire – Incredibly busy day on final edits (we hope) of the new Hunter/ Beatles book and (would you believe) the archive side of the (hopefully) forthcoming David Essex movie. May 5 was punctuated by the arrival of Producer, Simon Lupton’s truly stunning, “Sizzle Reel” (trailer) of the movie/ screen adaptation of Keith’s Marilyn book. “Thank you. It is simply wonderful, simply wonderful,” he said immediately after watching it. (4/5) Leafy Berkshire – RC Rockin’ The Box article day. Keith’s piece on the 1979’s History of The Who show was completed. (4) Leafy Berkshire – May Day Bank Holiday over, it was another “Mega Busy” day – Besides starting on his latest RC Rockin’ article, Keith spoke / sorted business with Paul Skellart at Archivum / Bob & Billy about the Cavern book / Alexa about the new George Carlin movie and fellow (top/ revered) archivist, Lisa Savage who had flown in from Australia especially. Three new titles have been added to the books page. Click here to take a look. Still A Chance to Join the Circus and Get Stoned! Now digitally re-mastered by Paul Skellett at Archivum, Randolph's iconic images have never, EVER looked this good! With only 5 days remaining to get your name in this publication, I thought it was time to give the work another, well-deserved plug. With top-notch editorial and research work by Paul and myself, this really is a Stones book like no other. April 2016 "Not My Monkey's..."
- Canada – Whoa! Get This!! The paperback version of Marilyn suddenly returned to the #1 position in the “Best Sellers in Monroe, Marilyn” chart on Amazon Canada. Wow!! Simply incredible. It was also spotted at #4 in the “Books > Humour & Entertainment > Movies > Biographies” and in the #80 position in the “Books > Biographies & Memoirs > Arts & Literature > Entertainers” sections on the site. (22) The World – The latest edition of RC, featuring Keith’s piece on The Who, crashed thru letter boxes of subscribers across the Globe. (13/14) Leafy Berkshire – Even more editorial work on the forthcoming Beatles Encyclopaedia. (9) Grand National Day, Aintree, Liverpool – Yes. The world stops and watches. Its sports’ biggest day, the most exciting horse race in the world, The Grand National. (4) Leafy Berkshire – Ultimate Record Collector deadline day. Concluding work on The Who’s riotous January 1973 appearance with Russell Harty. March 2016 "Things are warming up..."
(31) Leafy Berkshire – All go here, Keith started work on his latest Rockin’ The Box article for RC magazine. This month’s topic, the missing, historic, riotous and extremely rare video footage from The Who’s January 1973 appearance on LWT/ ITV’s Russell Harty Plus. -Then, at 4pm (3pm GMT, 10am New York time), Keith gave a lengthy interview to Todd at The Huffington Post. The topic of conversation? The break-up of The Beatles. (30) Windsor – First meeting between Mike, Paul Skellert (Archivum) and Keith to discuss their new, Rock And Roll Circus project. (21 onwards) Leafy Berkshire – Time is spent promoting the new Pledge Circus ’68 project (as it was now known), researching the new George Carlin movie as well as concluding the fine-tuning of the forthcoming Hunter Davies Beatles Encyclopaedia. (17 - 18) Pledge Music – 6pm, after many, many months of planning, the big launch of the Randolph, Rolling Stones Rock And Roll Circus campaign finally took place on Pledge Music. Incredibly, by 11 the following morning, it had already reached 22 per cent of its target! Simply incredible! (14) Canada / UK – With stocks seriously depleted (just one remained in store), the paperback Marilyn found itself in the #3 position in the “Most Wished For in Monroe, Marilyn” section on Amazon Canada. (10) Leafy Berkshire twinned with Pledge and the World – It’s almost here. After many months of planning, it was announced that the official launch of the new, Rock And Roll Circus / Pledge Music campaign will launch next Wednesday, March 16, AT 6pm UK Time! (7/8) Leafy Berkshire – Two frantic days, preparing the new Pledge Music, Mike Randolph Rock And Roll Music campaign as well as fine-tuning text on the new (monster, million paged) Hunter Davies Beatles Encyclopaedia. (3) Central London – Another trip into the Big City, this time for a 1:30pm meeting with the top designer, Paul Skellart of Archivum. This was followed by another hugely-enjoyable visit to the BAFTAs where Keith’s good friends at AP were holding another private get-together and screening. (2) Leafy Berkshire – An extra dose of RC work; a review of a newly released Beatles book, plus additional work on a forthcoming, hopeful TV documentary. (1)Leafy Berkshire – Another month, another Record Collector article. This time, Rod Stewart’s second solo appearance on LWT/ ITV’s Russell Harty Show in October 1974. JOIN THE CIRCUS AND GET STONED! Join in now. Now digitally re-mastered by Paul Skellett at Archivum, Randolph's iconic images have never looked so good. February 2016 "The Dawn of a New Era"
(23) “The Office,” on Charing Cross Road, Central London – First pre-production meeting with the personnel involved on the film of the new movie, documentary on the life of the late, great, controversial US stand-up comedian, George Carlin. (17) Leafy Berkshire – Another monster, action-packed day with lengthy discussions involving the new Stones’ Circus ’68 and forthcoming movie projects. (15) Canada a go-go – The softback of Marilyn continued to sell. On Amazon Canada, in the Bestsellers Rank, it was seen at #2 in the “Biographies & Memoirs > People, A-Z > ( M ) > Monroe, Marilyn” listings; #18 in the “Humour & Entertainment > Movies > Biographies” rankings and at #151 in the Biographies & Memoirs > Arts & Literature > Entertainers charts, and with that, the book was, once more, completely out of stock on the site. (13) Canada – Still hanging in there – The paperback Marilyn was seen at the #326 position in the “Books > Humour & Entertainment > Movies > Biographies” section on Amazon Canada. (9) Leafy Berkshire / twinned with London – Breaking News! A contract was presented on a rather exciting new film project! More News Soon! Canada – In the Amazon Bestsellers Rank on Amazon Canada, the paperback version of Marilyn was seen at #20 and #290 in the “Biographies & Memoirs > People, A-Z > ( M ) > Monroe, Marilyn” and the “Humour & Entertainment > Movies > Biographies” sections of the site respectively. (5) Leafy Berkshire – Incredibly, even more work on the forthcoming, definitive new Hunter Davies Beatles tome. (31) The sad death of DJ, broadcaster, Terry Wogan was announced. Keith had the fortune of meeting him in July 1973 when he opened the new Sperrings stationary, gift shop in Slough High Street. "He signed my Slade, Skweeze Me, Pleeze Me sticker that day," Keith fondly recalled. (30) Italy – Another superb, five-out-of-five review of Marilyn, this time by “DaMILENA” was placed on Amazon Italy. (26) Leafy Berkshire – Keith submitted his annual tax returns. “Yippee all round,” he screamed. 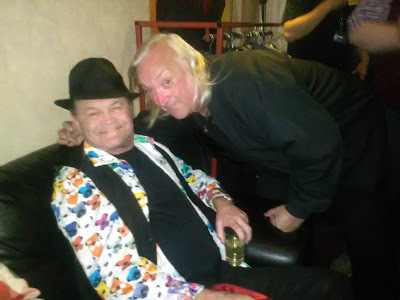 (25) Liverpool – It was announced that Monkee, Micky Dolenz will be one of the star guests at this year’s Liverpool Beatles Convention and with Keith (a long-time fanatic of the group) in contention to (once again) run the video show at the event, he was one very happy chap indeed!! (24) USA – Many thanks to “TECon” for their Five-Star review of Marilyn (hardcover version) on Amazon Canada. “Excellent book!” he/ she wrote. (21) Leafy Berkshire – Massive day of catch-ups and initial work on a new project discussed with Laurence one day earlier. - Canada – Marilyn (paperback edition) suddenly climbed to the #2 position in the “Biographies & Memoirs > People, A-Z > ( M ) > Monroe, Marilyn” section of Amazon Canada. In the same chart, on the same day, the hardback version was to be found at #18. Meanwhile, the softback was also seen today in the #6 position in the “Humour & Entertainment > Movies > Biographies” section of the site. Nice one! (20) West / North London / Leafy Berkshire – Yet another (thankfully) crazy day with a lunchtime meet with one of the country’s top property buyers/ developers, Laurence and then an evening catch-up with one of Keith’s longest-ever friends, Daniel J. (19) Leafy Berkshire – Another frantic day, with work involving the David Essex movie, Cavern club book and the clearance of songs for use on the forthcoming Brian Jones flick. (18) Leafy Berkshire – Crazy day; with discussions / telephone plans involving a project with radio legend, Dave Cash, the new David Essex movie, and the forthcoming, high-quality Stones’ Circus and Beatles live ’66 publications. (Week prior to 15) Leafy Berkshire – More fine-tuning on the Cavern text as well as (would you believe) additional editorial work on the forthcoming Hunter Davies / Beatles Encyclopaedia. (9) Canada – Get this. In the Amazon Bestsellers Rank, the paperback version of Marilyn suddenly climbed to the #2 position in the “Biographies & Memoirs > People, A-Z > ( M ) > Monroe, Marilyn” section of the site. On the same day, same site, it was spotted at #46 and #320 respectively in the “Humour & Entertainment > Movies > Biographies” and “Biographies & Memoirs > Arts & Literature > Entertainers” sections. (5 – 7) Leafy Berkshire – Further work on the deluxe, limited Edition Cavern club book when fine-tuning of the text took place. (4/5) Leafy Berkshire – A return to work! Welcome to the New Year. RC’s Rockin’ The Box deadline loomed large on the opening day; first up, Rod Stewart’s 1973 appearance on ITV’s Russell Harty Show. December 2015 "Everywhere It's Christmas!" (30) Europe – Latest edition of Record Collector arrived at homes/ businesses / subscribers across UK / Europe… 2015 is now pretty much over. Here’s to 2016!! (29) Italy – Amazon Italy Marilyn (kindle version) had climbed to the n.106 position in the “Arte, cinema e fotografia > Cinema e television” section on the site. (28/29) Leafy Berkshire – With Christmas still being celebrated, Keith spent two days tidying-up/ wrapping the final draft text for the Cavern club book. (25) Christmas Day – Leafy Berkshire – The big day arrived. Keith spent it with his beloved Mother, Kathleen. The finest anyone could ever wish for… A big "Thank you to the staff, Nurses and carers for helping to make this day so memorable." - A big "thank you" must also go to the legendary DJ, Dave Cash who, at approximately 9:41 on Christmas Day morning played for Keith's Mum, one of her favourite-ever Festive songs, Johnny Mathis' 'When A Child Is Born'. "Cheers, Dave, you are a top chap indeed. Thank you, from both of us." (23) BBC Radio – With The Beatles’ catalogue about to go on streaming for the first time, Keith was asked to talk about it on The Paul Ross Show. During which, Paul to Keith, “If I go on Who Wants To Be A Millionaire, will you be my Phone-A-Friend?” “Of course, I will,” Keith replied. (21) London – Meeting in Wandsworth between Keith, director, Alan G. Parker and producer, Alexa Morris. Several, exciting new projects were discussed and placed firmly in the 2016 pipeline, so watch this space. Afterwards, a hastily-arranged trip to the Emirates to watch Keith’s beloved Arsenal beat Manchester City 2-1 in the Premier League. Yay! (18) Leafy Berkshire – Time for another catch-up with the producer, comedy legend, Simon Lupton. The hours whizzed-by before a trip to Pinewood Studios was made, where shooting of the new series of Red Dwarf was taking place. (14) UK – Looking outside the top of the charts, on Amazon UK, Marilyn was at #208 in the “Biography & True Accounts > Arts & Literature > Actors & Entertainers” in the Kindle store. (13) UK – Wow! Another 5.0 out of 5 review of Marilyn (Kindle version) by someone called “Amazon Customer” was placed on Amazon UK. (12) Berkshire – Another trip out to John Barratt’s fine bistro. Fine food and top conversation was the order of the evening here. (8) Windsor – Another trip to Queen Country for another 1:30pm meet with the legendary snapper, Mike Randolph. (7) Canada – Marilyn (paperback) was still, “Temporarily out of stock” on Amazon Canada. (4) Canada – Thanks to Patti Burrows for her five-star review of Marilyn (paperback version) on Amazon Canada. On the same day, same version was at #7 in the Marilyn Best Sellers listing. (3) Canada – In a rush to Christmas, the paperback version of Marilyn temporarily out of stock on Amazon Canada. (2) London – Keith, and guest, friend Gemma Williams was in attendance at Proud Gallery’s private, Sinatra at 100 exhibition party. (1) UK – Marilyn was spotted at #53 in the “Books > Biography & True Accounts > Arts & Literature > Actors & Entertainers” Kindle store on Amazon.co.uk. November 2015 "The Christmas Countdown Begins!" (27) Italy – Marilyn (Kindle) was spotted at the n.45 position in the “eBook Kindle > Arte, cinema e fotografia > Cinema e television” section on Amazon Italy. - Meanwhile in America, on Black Friday, and ready for the Christmas rush, a fresh batch of Marilyn’s (softback edition), reached the Amazon.com warehouse. (25) Hollingbourne, Kent – Work continued on the new, Pirate radio TV documentary. Keith, and his production team, met up again with another true, 1960s legend, this time the broadcaster Dave Cash. “Thanks to you and Sara, for making us welcome in your fine abode,” remarked Keith. “Your delightful tales about life on the Pirate ships, will delight the world, I’m sure.... sorry I kept asking you about The Monkees!" (17) Italy – Amazon Italy, the Kindle version of Keith’s book, Gli ultimi giorni di Marilyn Monroe: Le relazioni pericolose, le trappole, il presunto suicidio: tutta la verità sulla fine, reached n.43 in the “eBook Kindle > Arte, cinema e fotografia > Cinema e television” section of the site. -While on Amazon Canada, the hardback edition climbed to #85 in the “Biographies & Memoirs > People, A-Z > ( M ) > Monroe, Marilyn” listings. (16) Canada - Amazon Bestsellers Rank, Marilyn (paperback) at #32 in the “Biographies & Memoirs > People, A-Z > ( M ) > Monroe, Marilyn” and #392 in the “Humour & Entertainment > Movies > Biographies” sections of the site. (13) Leafy Berkshire – Friday the 13th. Unlucky for some. Our Mr Badman travelled out to Windsor again for another 1:30pm meet with Mike Randolph. - At 2:27pm, Keith appeared live on BBC Radio again, featuring in an interview with the UK Showbiz legend, Paul Ross. (6) Canada – Copies of the paperback version of Marilyn finally arrived at Amazon Canada, but as of today, just one remained in stock. It had almost sold out again! (3/4/5) Peter Lawford-land – Keith completed his annual November trip to “Peter Lawford” land. Most enjoyable it was too. - Many thanks to the top director, Alan G. Parker for the “wonderful researcher” credit to KB on his twitter feed. (2) Leafy Berkshire – Keith completed another article for Record Collector magazine. Today’s topic, Brian May’s rarely screened 1974 TV appearance on LWT’s London Bridge. On the very same, the latest issue of the mag arrived. (31) Canada – The softback version of Marilyn was spotted at #12, and the hardback at #16 in the “Most Gifted” section on Amazon Canada. On the same day, and place, a “Temporarily out of stock” notice about the paperback version was posted on the site. (29) London – An incredible 16 years after its release, Keith’s 1999 Omnibus Press book, The Beatles: After The After The Break-Up, 1970 – 2000 was used extensively and (thankfully) credited in today’s Daily Mail piece about John, Paul, George and Ringo’s first solo concerts. “Thanks for the credit,” Keith Remarked after seeing the article. (28) Berkshire – Mega busy day, with work involving Mike Randolph’s Circus, the Cavern club book and the Dave Cash shows. Conversations with Bob Young and Cash himself peppered the day’s proceedings. (27) Berkshire – Another action-packed day. Top-of-the-agenda, the Cavern book project. A lengthy call with Paul at Archivum also took place today. (26) Canada – Meanwhile, the paperback version of Marilyn was still out of stock on Amazon Canada. (23) Windsor, Berkshire – Another trip out to Her Majesty-land to see Mike Randolph and exchange news of the on-going Stones Circus ’68 project. - The David Essex Story – A momentous day for the documentary when, at 5pm today, the Pledge Music site launched its campaign for the film. (22) London – A catch-up with old mate, Tel Rawlings at The Ship in Bermondsey. (15) Windsor, Berkshire – Another 1:30pm meeting with Mike Randolph. (14) Canada – Well, simply incredible. The paperback edition of Keith’s Marilyn completely sold out on Amazon Canada! - Leafy Berkshire - Further synopsis work on Mike Randolph’s Circus ’68 project. (12) Canada – Hey! Hey! A nice surprise when the Kindle version of Marilyn suddenly climbed to the #2 slot in the “Best Sellers in Monroe, Marilyn” section on Amazon Canada. While, on the same day, same site, the book was also seen at the #11 slot in the “Humour & Entertainment > Movies > Biographies” and at #27 in the “Biographies & Memoirs > Arts & Literature > Entertainers” Kindle Store. (9) Leafy Berkshire – Phew. Another action-packed day. Following a conversation with director, Alan G. Parker, with John Lennon reaching what would have been his 75th birthday, Keith made several BBC interviews to talk about it; on the Anne Diamond and Paul Ross radio shows. - Windsor, Berkshire – Another 1:30pm meet with legendary photographer, Mike Randolph. (7) Goodreads – One for the “It slipped thru my net” depart. A big thank you to reader, Heather Watson for her wonderful, 5 out of 5 stars review of Marilyn on the Goodreads website. “This is the most well written Monroe biography to date,” she said. “It was diligently researched and almost completely unbiased in its' speculations regarding her passing. I was captivated and towards the end I almost felt like I was reading a suspenseful fiction…I learned some new facts I never knew and that left me completely satisfied with this book. Bravo, Mr. Badman.” And Thank You Heather! Much appreciated! - Ground-breaking research on the new Cavern project continued. (6) Surrey – With work on the Cavern club project gaining momentum by the day, Keith made a trip out to visit the home of Bob Young, top musician, and Status Quo friend/ co-songwriter. (Up to 5 – Early part of the month) Leafy Berkshire – Keith carried-out further extensive research work on the new Cavern book. “The number of rarely-seen, truly staggering items I’ve come across, or been sent is simply incredible! I’m lost for words,” Keith remarked. (29) Leafy Berkshire –full-speed ahead now on the new History of the Cavern book, which is set for release in December 2016. - Meanwhile, a big thank you to Mr. Nigel Quiney who posted a rather nice review of Marilyn (kindle version) on Amazon.co.uk. He wrote, “I didn't think that there was much left to say about Marilyn but amazingly Keith Badman's book was illuminating and well worth the read. Congratulations.” Thanking you, kid Sir! (28) South London – Another trip into South London, for a meet with Tel and producer, Mike Chappers. Top of the agenda, The Pirate Radio documentary with Dave Cash. (23) Canada – Well I never… the paperback version of Marilyn climbed to the #2 position in the “Most Wished For in Monroe, Marilyn” and #5 in the “Biographies & Memoirs > People, A-Z > ( M ) > Monroe, Marilyn” sections of Amazon Canada. Phew! -Meanwhile, it’s all systems go. Work on the forthcoming, officially endorsed Cavern club book properly began today. (21) Canada – A rather pleasant leap up to the #3 position for the paperback Marilyn in the Amazon “Best Sellers in Monroe, Marilyn” section on Amazon Canada. While on the same day, the book was also to be found at #49 in the “Humour & Entertainment > Movies > Biographies” and at #316 in the “Biographies & Memoirs > Arts & Literature > Entertainers” sections of the site. (18) Leafy Berkshire / London – A major breakthrough with ITV re copyright ownership of the Dave Cash Radio Programme. Watch this (rather exciting) space. (14) Leafy Berkshire – The day was spent fine-tuning items in readiness for the big, highly important meeting in London tomorrow. (11) UK – A rise of one place. Oh yes! Keith climbs to the no.10 position in the “Most Popular People Born in Slough” listing on Amazon.co.uk. (10) Leafy Berkshire – A return trip to Windsor to meet and discuss the on-going Rock And Roll Circus project with super-snapper, Mike Randolph. (9) UK– The latest edition of Record Collector magazine, featuring Keith’s write-up on Ringo’s 1973 appearance on Russell Harty Plus flew thru the letterboxes of subscribers across the country. (5) BBC Four – Another repeat screening of the two-part, 2011 Award-nominated documentary, Queen: Days of their Lives, which featured Keith’s archive research. Once more, high viewing figures were there to watch it. (4) UK – Hey. Get this. Keith was to be found at the no.11 position in the “Most Popular People Born in Slough” category on Amazon.co.uk. (30) UK – Thanks to “Mrs. C” for her rather nice, four-star review of Marilyn (Kindle version) on Amazon.co.uk “Interesting information,” she said, “…This one rings mostly true to me.” Thank you! - Liverpool Convention, Adelphi Hotel – Keith presented the video-show at Europe’s biggest Beatles fan get-together and also partook in the obligatory “Eggheads” competition. After much banter, and frivolity, his team, “The Badman” beat Billy Heckle’s by 13-12. It now stands 1-1. The decider will take place at next year’s convention. The question-master was the highly-respected author and Beatles historian, David Bedford, whose questions were HARD… to say the least!! (29) Slough twinned with Liverpool – Keith headed-off to Beatle-Land for the big annual, Fab Four Convention. (27) Leafy Berkshire – Top US record dealer, and mega Beatles fan, Bob Boyer arrived at Chez Badman to begin four days of Fab Four mania. (26) Canada – Marilyn book update… the paperback edition was spotted at #31 in the “Biographies & Memoirs > People, A-Z > ( M ) > Monroe, Marilyn” and at #371 in the “Humour & Entertainment > Movies > Biographies” sections on Amazon Canada. While in the “Most Gifted in Monroe, Marilyn” area of the site, the softback version was seen at #12 and the hardback four places below at #16. (20) Leafy Berkshire – Keith wrote a most favourable review of the superb, new Billy Fury DVD, The Sound and the Fury for Record Collector magazine. (19) Leafy Berkshire – RC deadline-day again. This month, a tribute to Cilla Black and her appearance on the 1965 Granada TV special, The Music of Lennon & McCartney. (15) Leafy Berkshire – With the influx of American visitors about to descend on Chez Badman, Keith carried-out further decorating work on his property. (14) Windsor – 1:30pm. Another Stones Circus ’68-related meeting with the legendary 60s/70s snapper, Mike Randolph. (11) Leafy Berkshire – Keith completed work on the video show for this year’s Beatles Convention in Liverpool, which is due to take place in just over two weeks’ time. (4) London – Visit to the London studio of Chris Difford (Squeeze) with Tel, Chappers and legendary DJ, Dave Cash to begin work on the first phase on their new, Pirate Radio documentary. (3) Leafy Berkshire – Phenomenally busy day, which included conversations with the legendary DJ, Dave Cash and frenzied, archive research/ negotiations on the (almost completed) David Essex Story. Emails from the great man himself peppered the activities. -For a few short hours this morning, the softback edition of Keith’s Marilyn was still in the top-spot in the “Most Wished For in Monroe, Marilyn” section on Amazon Canada. It fell to #4 shortly after. () Canada / Italy – Incredible start to the month when Keith’s Marilyn (paperback edition) raced back to the #1 in the “Most Wished For in Monroe, Marilyn” section on Amazon Canada, knocking J. Randy Taraborrelli’s The Secret Life of Marilyn Monroe into second position. While, on the same day, in the same chart, the Kindle version of it was at #11! Meanwhile, over on Amazon Italy, the kindle version of Keith’s tome was to be found at n.106 in the “Arte, cinema e fotografia > Cinema e television” section of the site.